Planted in 1999, Denner Vineyards is a winegrowing estate on the far western border of the Paso Robles AVA. 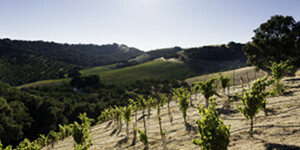 Their 156 acres press up against the Santa Lucia Range, giving the site great diversity of elevation, aspect and soil. The estate is nestled into the Templeton Gap, an East/West corridor where the marine layer can reach the inland valleys. As a result, Denner Vineyard enjoys a near-perfect growing climate: extreme diurnal temperature swings with warm growing days and cool nights, adequate wind influence, and low moisture in the vineyard. The 108 acres under vine are comprised of 19 different varieties in 26 unique blocks. Each block is farmed with painstaking attention to detail, allowing only for the best possible grapes to reach the winery. Aron Nevarez, the vineyard manager, is committed to environmentally friendly farming practices, using only sustainable inputs and minimal irrigation. Founded by Stevan and Christine Larner in 1997, the Larner Vineyard is located in the heart of Santa Barbara’s most renowned grape-growing region: Ballard Canyon. The 134-acre ranch is planted to 34 acres of vine, including Rhône varieties Syrah, Grenache, Mourvedre and Viognier. 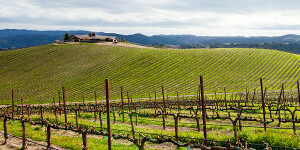 Located only 4 miles from the Pacific Ocean, Les Galets Vineyard is one of the coolest wine-growing sites in the state. South-facing hillside blocks of calcareous and volcanic soils offer high drainage, while the constant marine influence, cold nights and warm afternoons combine to promote low-yielding, dark, and spicy Syrah that is equally intense, graceful, and lifted by natural acidity. As part of their ongoing commitment to meticulous and sustainable farming practices, John Ahner and Jody McKellar received their CCOF organic certification in 2010. Luna Matta Vineyard is located on the west side of Paso Robles, and the characteristic warm days and cool nights influence the steep hillsides and limestone-laden soils with perfect growing conditions for Rhone varietals. The Santa Barbara Highlands Vineyard is unlike any vineyard on California’s Central Coast. Over 60 miles east of the Pacific Ocean, the property covers rolling hills and mountain plateaus at an elevation ranging from 2,800 to 3,200 feet above sea level. Cutting a path through the property is the Cuyama River, which supplies most of the property’s water. The annual rainfall amounts to only 5-12 inches. This extreme aridity translates to excellent ripeness on a regular basis, even in the most challenging of vintages. Passive frost prevention from nearby hills opens cold air drains, moving cold air into the vineyard and out along the river. The Cuyama River contributes beneficial bench lands and alluvial soils to the wide array of soil types across the property, including everything from rocky sands to loamy clays. This broad spectrum of soils is highlighted in the wines: Lighter textures ripen fruit faster, giving jammy fruit flavors, while heavy clays mature fruit more slowly and show more spice and earth characteristics.